HCTF grant recipients Delta Farmland and Wildlife Trust have been working with farming operations on the Fraser River delta to enhance farmland with winter cover crops of cereal grasses, forage grasses, clovers and legume mixtures. Not only does this enrich the fertility of the soil, it also provides much needed fuel for migrating waterfowl passing through the delta. “This project directly supports Delta and Richmond farmers committed to land stewardship. These 18 farmers have established over 2,850 acres of winter cover crops on farmland for the 2018 project year.” says Program Manager Drew Bondar. 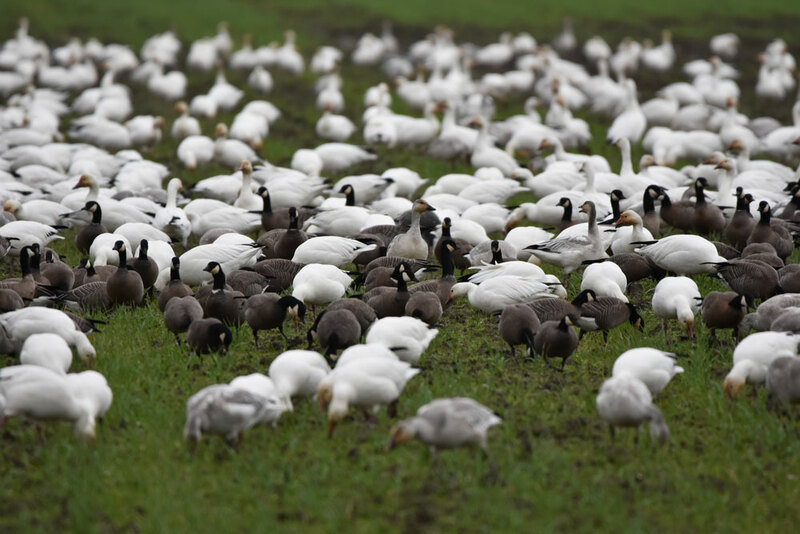 photo: Snow & Cackling Geese grazing on winter cover crop in Richmond.